Of course, I hope all know that any fantasy of getting rid of IPRs is gone with this chart. It will be said (probably repeatedly and loudly by Lemley) that the IPRs are working. See here is the proof. The great burden of patent cases on the federal courts is gone. Joy to the world. Not to deny the impact of IPRs [filed in about a quarter of patent suits?]. But, as noted below, since IPRs have been in full use since 2013 [and before that we had quite a few inter partes reexaminations], why did this decline in new suit filings not even start dropping until 2016 and go down so much since, if IPRs are the main reason for the drop? Was it the persistence of the “fantasy of getting rid of IPRs” [as you put it] among patent litigators and clients who would have been better advised consulting genuine Sup. Ct. litigator constitutional law experts? Your joking right? Any patent subject to an IPR that is enforced is going to get hauled into an IPR (ok, so maybe it’s not malpractice per se, but it’s got to be close). 1. Everything which can be invented has been. 2. Everyone who can be sued has been. 3. Everyone who should be sued can’t (affordably) be. O/T: Anyone have any PTAB figures yet on pre-Phillips filings? I would expect a huge INCREASE in patent litigation if even 1% of the country’s patent attorneys (and their clients) actually believed this. To take a tangent to your comment (since you do not seem to appreciate the historical nature of the “everything that can be invented” input anyway), that “even 1%” notion can be noted to apply to the norming factors (which you also do not seem able to appreciate), in that the “signal” being sought is simply drowned out in noise if even 1% of the norming factors change. There is an adage of the tail wagging the dog. So often in the patent sphere, we see the “boogeyman” effect and attempts to have the tail of the flea sitting on the tail of the dog wag the dog. Sometimes simply acknowledging the relative scope of numbers (as may be done with norming), puts things into a more critical-reasoning perspective. Educate everyone, Billy. You’re a very serious person! Charles H. Duell, Commissioner of the US Patent Office, 1899. Come Malcolm, even a pro say recognizes this. And it’s not as if it hasn’t been posted by me before (and you have claimed to be able to review ALL of my posts in a four hour window. Your failure is stultifying. And that’s even with the already low standards that you may have associated with your posts. Yeah and patents “stifle innovation” too. /s Economics and common sense turned on it’s head when run through the ‘big lie’ filter. That “stifling” can easily be seen as paralleling the Far Left Liberal view that has created a “trophy” generation of people who expect participation trophies. The real world has always been that promotion comes from BOTH a carrot and stick approach. A carrot of direct reward for innovators. A stick to beat those who would transgress what has been given to the innovators. As I have often noted, “Necessity is the mother of invention,” and it is when one IS blocked, that creative juices are unleashed and promotion occurs when others then seek to invent to get around the blocks. The Liberal Left though get “stuck” with the “block” itself and see that “block” as itself being a “bad” thing. The Efficient Infringers on the “Right” (not necessarily the political Right, think more like “Big Business Right) are only too happy to join an attack on the patent system in this regard. 4. And even if you can thread that needle there is no market impact against the sued or un-sued. Yeah, that Berkheimer decision has really broken the dam on patent litigation. Oh, wait. Way to soon to tell among patent claims at risk from Alice attacks [which is a minority of all claims sued on] the % which Berkheimer could make more winnable over Alice motions with factual disputes in step 2. But at note 3 below are listed a number of other factors for reduced new suit filings which in total should have had way more effect than that? As soon as those Alice “factual” suits become more “winnable”, the sooner the whole artificial edifice propping up logic “on a computer” cases will be destroyed. We’re already past the point where applicants and courts who are evaluating patents are forced to listen to “factual disputes” about the accepted meanings of claim terms (!) that are wholly unrelated to any physical structures. At some point, a wise judge is going to say that enough is enough. It should have happened 20 years ago but … it’s going to happen soon. The pendulum is never, ever swinging back on this junk. A patent claim is a communication between artisans. A claim is one engineer/scientist speaking to another. Terms of art are critical to the meaning of a claim. Allowing judges to subjectively interpret the language that has been carefully been crafted and approved by engineers, in their own argot, for an audience of other engineers, is an insult to the hard work that inventors, attorneys, and examiners invest into patent claims. The judiciary is confusing the ability to give _a_ meaning to a claim with the ability to give _the_ meaning that a claim would have to a relevant artisan. Is there any other area of the law where judges, when charged with understanding the meaning of words, give so little regard for who spoke the words and who was intended to hear them? First you gotta figure out who the relevant artisan is, which is a far cry from simple with many, many information inventions. What is an information invention? A claimed “invention” that differs from the prior art only by the recitatoin of abstract “limitations” directed to data processing logic or information content. Are you unable – or unwilling – to see the circularity of your reasoning? He is simply inte11ectually dishonest. Yes, this is a necessary preliminary to almost any other aspect of the validity or infringement analysis. The good news is that (in my experience) the U.S. district courts do a pretty good job of making this assessment early on (certainly by Markman, often earlier by stipulation of the parties). The bad news is that the USPTO (in my experience) never does this. As in, I have literally never seen an office action where the Examiner makes a finding of fact about who the relevant artisan is. The closest I have ever seen the PTO come in this regard is a totally circular assertion that the person of ordinary skill in the relevant art is a person having an ordinary level of education and experience in this field (without specifying what “this field” is, despite the fact that this is perhaps the most critical question of the analysis). … which is a far cry from simple with many, many information inventions. I doubt it is a simple business in any more than 10% of inventions. There is nothing uniquely complicated about “information” inventions (whatever that term means). Greg De: I doubt [determining who the relevant artistan is] is a simple business in any more than 10% of inventions. There is nothing uniquely complicated about “information” inventions (whatever that term means). I beg to differ here. Determining the relevant artisan is usually not difficult. Information processing “innovations” present special difficulties because … information processing. We all do it and we’ve all been doing it forever which is not the case for, e.g., genetic engineering. The most relevant “artisan” in many information processing inventions is the patent attorney who scrivened the g@ rb@ge claim. The next most relevant “artisan” is the “artisan” in the analogous non-digital area of endeavor (e.g., the real estate broker; the bank teller; the accountant). The next most relevant “artisan” is a statistician, mathematician or philosopher. The least relevant artisan for the purposes of determining the validity of the claim with respect to the prior art is usually the person who ultimately ends up doing the actual work to make an object falling within the scope of the invention operate without bugs, i.e., the instruction writer. That person is least relevant because there are no “innovative” instructions recited in the claim, ever. Pretending that information processing “innovations” are just like every other invention is really one of the silliest things that a patent attorney can do. But you’ve been plowing that field for some time now, Greg. Congrats? You have to try really hard to get things so wrong Malcolm. Information inventions are often models, simulations, or abstractions of something real in the world. Locating the novelty is critical to locating the relevant artisan, which is just another way of saying that inventions need to be construed as a matter of law (i.e. expanded Markman) at some preliminary point in a patent suit- including, of course the basic question of eligibility. We keep getting to this point and then slipping to another thread. I can see patent protection for MPEG and the like, even though it’s completely intangible. I’m not sure how the lack of tangibility removes the invention from the patent system, but I am darn sure how that happens when thinking about a correlation or being told where to look for something you want to know. The fact that you can list off “artisans” in order of relevance without even knowing the specifics of the invention that we are supposed to be analyzing tells me that you do not actually consider the task of identifying the artisan to be all that difficult. In any event, I did not say that identifying the artisan is easy in the case of “information” inventions. I simply said that it is no harder than non-“information” inventions. To offer but one example, from a field that I know first-hand, one common fight that we have in the pharma world is whether the relevant artisan is a research pharmacologist or a clinician. Branded pharma tends to prefer that the PHOSITA be a clinician (because they know less), while generics tend to prefer that the PHOSITA be a pharmacologist. It is often a close case which of these is correct, which is just as much as to say that it is hard all over to identify who is the notional artisan. Just because the difficulties to making this assessment in “information” technologies are different from the difficulties to making the assessment in medical technologies does not mean that one or the other is especially more difficult than the other. Just because the difficulties to making this assessment in “information” technologies are different from the difficulties to making the assessment in medical technologies does not mean that one or the other is especially more difficult than the other. Except that historically the PTO and the courts have had extreme difficulty identifying the relevant person (and the relevant art). Yes, choosing between a ‘clinician” and a ‘pharmacologist’ might be “difficult” but at least these two occupations are somewhat in the same ballpark (as opposed to, e.g., “computer programmer” and “grocery store clerk”). Please give us all a break. There is no body that “approves” or standardizes the ridiculous v0mit-launching terminology that shows up in the patent claims for “carry out this logical process using a computer” “innovations.” It’s made-up bal0ney that’s made-up mostly for marketing purposes. Anyway, that’s not even the main point of my comment. My point was whether or not some “software engineer” (a gag-worthy term in itself) “approves” of some term doesn’t change the fact that the term (e.g., “object” or “data structure”) carries no physical/structural weight whatsoever, and that’s true regardless of whether you call it a “score weighting structure” or any other content-descriptive or function-descriptive name. Recall that an entire sub-body of patent law was developed around the concept that certain elements in a claim were necessarily to be ignored because they were abstract. Then a ridiculous nonsensical “exception” was created and SURPRISE (nobody could have predicted!) the entire system was corroded by a massive bolus of claims that recited nothing but abstractions with the occasional mention of an amorphous black box called a “processor” or a “computer”. That’s the joke that’s coming to an end. The pendulum is never swinging back because amount of cr@p in the system already is gumming it up horribly. Those of us who’ve been around for a while have seen it all. “Artificial intelligence” has got to be the st0 0o pitest grift in the history of patent law. Sounds like you want to make an enablement argument (as opposed to an eligibility arguement). You mean like the point of novelty in Diehr? Oh wait, you’ve run away from that already. Brushing aside your feelings, you appear to maybe wanting to make an argument based on inherency (otherwise, all that you are doing is that Big Box of Protons, Neutrons, and Electrons things). Maybe revisit the Grand Hall experiment for the disposal of that inherency argument. Or maybe you want to continue to dissemble on this form of innovation most accessible by the non-onepercent. Oh wait, you have constantly run away from that as well. Well, is there anything that you will not run away from? It’s not. You’ve been educated on this point already. The form of innovation “most accessible” by the non-onepercent are novel mental processes without any reference to structure. And those are banned, without controversy. There are other “more accessible” forms as well. As an exercise, try listing a few of them because I’ve grown tired of listing them for habitual dissembling t0 0ls like you, Billy. Except for the fact that it is, your “been educated” might just be more than meaningless. As it is, well, your statement IS meaningless. The only dissembling here Malcolm is you. The increase in copyright litigation is interesting. I would be shocked if the increase was related to the decrease in patent litigation, except to the extent some companies might have a “litigation budget” and an army of lawyers that needs to keep itself busy … somehow. A breakdown of the types of copyright cases that are being brought would be interesting. I’m guessing most of the increase in copyright suits is due to litigation over content (video/audio/literature), and not over the alleged copying of logic instructions (i.e., software). Yes, and a surprising amount of (c) infringement litigation seems to be over music or lyrics? I wonder if anyone has ever brought a facial challenge to the copyright act on the grounds that it extends protections to much more than is authorized in the plain-sense letter of the Constitution? You do alight on one aspect that often escapes those discussing the Constitutional clause: promote not tied to a (linear or other) technical advance directly, but instead “promote” in the advertising sense of “promotion” (sort of like ‘ads in your face ). However, where you miss in a bit, is in forgetting just what is protected by that Constitutional clause. Just to be clear, I do not want the copyright law as presently constituted to fail as unconstitutional. I think that the great abundance of literature, music, film, computer games, etc that flourishes under the present copyright regime is a great thing. My point is merely that—in practice—what the copyright act really mostly serves to do is to promote what might be termed the “creative arts” (in contrast to the “useful arts”). The “creative arts” is a much broader class than the class of “science,” which is what the constitution authorizes the copyright act to promote. Therefore, I wonder if anyone has ever tried a facial challenge to the copyright act as extending beyond that which Congress is authorized to enact, and if so how the courts dealt with that facial challenge. To get the One True Story (TM), the number of litigation cases filed needs to be multiplied by the number of claims asserted and divided by the number of actual infringing events that are not identified. Yes, that’s an inside joke. In all seriousness, though, I am amazed that some of the maximalist types out there continue to believe (or appear to believe) that the amount of litigation correlates positively with the overall strength of the patents being obtained (or asserted). That’s just … bizarre. Patent litigation represents the failure of two (or more) parties to come to an agreement about the value of patent or the relationship of a patent to one party’s activities. That failure is almost always the result of uncertainty about the validity or scope of a patent, and that uncertainty is tied closely to the failure of the patent system to do its job. In other words, as long as patents are still being sought in large numbers (and they surely are), less litigation reflects less assertion of junky patents, i.e., less assertion of patents that alleged infringers are willing to fight about. Patents on correlations and patents on methods of applying “new” logic to data “on a computer” (or using computers to facilitate the application of old logic to “new” data content) remain the worst patents out there. Myriad and Mayo put a huge damper on the assertion of the former types of patents. Bilski and Alice made a dent in the latter type but the CAFC (and the PTO) have bent over backwards to keep life support on for the latter patents. And it’s the those latter patents that continue to weaken the system. Expunge them all. Inject certainty back into the system. And the system will be stronger than it’s been for forty years. It’s a bad joke and absolutely misses the point about what normalization provides. And I am not certain where you are getting all that straw for your strawman. That used to be true to some extent, but these days a high % of patent suits are filed on patents for which there was NO prior negotiation between the parties. I’m surprised that the gubmit hasn’t made a rule/law against that, esp if it is becoming rampant in the number of cases filed. Perhaps they will get on that shortly. Stuck in moderation, but a reply to 6 notes that there is a fundamental right of redress that 6 does not seem to recognize with his comment. The patent system today (the ‘law’ of 101,102,103, 112) and the collateral attack afforded by IPR’s create so much uncertainty and lack of repose that ‘two parties’ can come to a good faith agreement without litigation is a sick joke. No GC or IP in-house can come to a good faith opinion about any patent, let alone give it a market value, even if they wanted too. So you might just as well bring the suit, with “NO prior negotiation,” and attempt to get some of the issues adjudicated. It is down because small businesses with small portfolios are on to the scam. At $50M and 10 years to litigate, there are not many scenarios where enforcement makes economic sense. Litigation should be a last resort. If a case goes to litigation, one must wonder whether the patent was drafted less than competently. Accordingly, one must see a 45% fall-off in new case filings as a sign that patents are being drafted better, or that parties are finding ways to settle without having to go all the way to the last resort. Both of these trends are to be welcomed. So I suggest the word “slide” is unfortunate. How about using instead shrinkage? “one must wonder whether”. Max seems to be suggesting the possibility. It’s an interesting theory. From experience, I’m skeptical. idk about that, there was nautilus, and the office is now clamping down on 112 as well by usurping the office’s definiteness standard to basically be “anything we think is confusing we can reject herp”. Max, yes, litigation ought to be a last resort, and “shrinkage” of suits is a better term, but I have not heard or seen anyone publishing that U.S. applications are being drafted better [versus getting worse with increased corporate cost controls on prep and prosecution]. Nor anyone saying that negotiations before suing are increasing in the U.S.
My point earlier from the world of actual practice (not what it should be but how it is): (1) with a meritorious patent, (2) a great infringement case, (3) a worthwhile market and (4) lack of nearly as good non-infringing alternatives to the claimed invention, logic and practicality point to litigation as a first resort not the last resort. Even a GC or in-house IP counsel that wants to negotiate in good faith, they CAN’T, because of the crap shoot factors that are the current state of the patent laws. In other words, a good faith effort, that exchanged something meaningful in return for some external patent right, will be second guessed and the GC will look ‘weak’ and the IP in-house ‘stupid’ (or smart) in hindsight to the deal. Now, even after grinding past the 101, 102 and 103 – subjective standards – wherein under the law of 20 years ago, at this point you would get to material discussions and infringer (self reflection as to the ‘enterprise costs,’ e.g., the true value of the patent to the infringer, of halting infringement), you CAN’T now because post trial you are most likely to pay only a royalty per some crap shoot apportionment theory (the new legal damages) and at worst have some imputed compulsory license going forward, if any. And since we are talking about the dockets, this is why for imported products, you would be nuts to bring the case anywhere other than the ITC. This and the decrease in the number of US applications filed (from inventions made in the US) should tell everyone that the patent system is on the ropes. I think too this could be worse than it looks. We need a breakdown by AU of the patent. What is interesting to me is why this slide in new patent suit filings took so long to finally even start drop down from 2012 in 2015, and then to only gradually decline from there over three more years to its present level? We have already had for all those years, or well before, eBay’s great reduction in injunctions, the same rate of IPRs, and Alice, and Mayo unpatentable subject matter rejections! Also [and especially important, in my view] the numerous grants of significant attorney fee sanctions against patent suit parties over those years since the Octaine Fitness decision. ALL of these were widely argued to promptly kill off patent enforcement altogether. So, what took so long to finally reduce it by 45%? Some here may speculate foolish or trial-lawyer mislead patent owners taking to look to get realistic and still suing. However, I think it is more likely that there are still ample patents with potential infringement damages high enough to justify suing on and able to survive both 101 and IPR challenges. Plus an even greater numbers of patent owners, including many PAE’s, counting on the roughly 95% of corporate defendants who will quickly make settlement payments well before discovery and trial costs, and avoiding risks by either party of attorney fee sanctions. Will the filing rate drop continue further? One factor may be the IPR change from BRI to In re Phillips claim construction plus the new Sup. Ct. requirement for ALL IPR petitioned claims to be considered. This is predicted to increase the grant of patent suit stays, and thus possibly reduce those early settlement payments? The lag may have been due to waiting for those suits filed post 2012/Alice to come to resolution. Then by 2015 there is lots of information about how impossible it is to assert a patent. Good point NW. It seems to take lots of losing case decisions to get some folks attention to changes in the odds of success. But as for Alice, that case does not have nearly the impact on most art units and inventions as it does on software related cases, as you suggest at 4 above. My assumption is that the 2013-14 fall was due to Mayo, PGR, IPR, CBM, and supplemental examination taking the wind out of the sails of a lot of plaintiff-patentees. 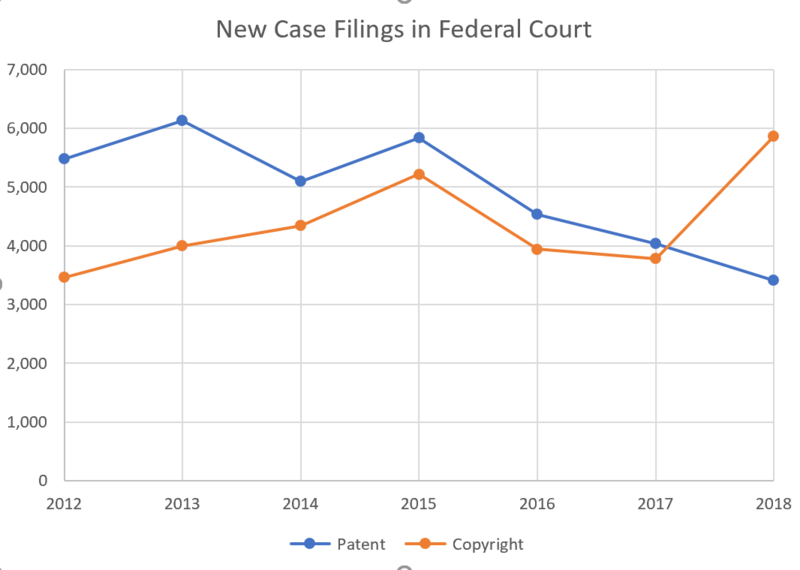 Similarly, I read the 2016-17 and 2017-18 decreases as the result of patentees realizing that, post-Alice and post-invalidity-via-12(b)(6), there is a lot less value in litigation. But it’s difficult to know without looking at the breakdown by TC. Under my hypothesis I would expect to see, e.g., chemical and mechanical patent litigation remaining correlated with other forms of litigation. Thanks JD, your above comment was filed the same minute as mine. Part of mine echos yours. Your mention of litigation claim invalidity for claim ambiguity of means-function claims for no spec support [missed in the PTO] under 12(b)(6)* is one I missed. But also another one that had been there for some years before this decline, and declining with the decline in means-function claims. Also note that the usages of PGRs, CBMs, and Supplemental Examinations [unlike IPRs or reexaminations] has been way too small to have any direct statistical effect on new patent suit filings. At what point (when normalized), does this lose signal to noise? Some one drunk some serious Kool-Aid. To get the true story, the number of cases filed needs to be multiplied by the number of claims asserted. Yes, that’s an inside joke.